This summer has been a whirlwind! I just arrived home from a travel teaching job in Rapid City, South Dakota and the Raindrop Convention in Portland, Oregon. My house and studio were spotless when I left…and look at it now (and this is just a portion of it)! I have just a week until I am off again, this time to Marlborough, Mass for the New England Convention. My studio table is stacked from unpacking my travel tote, with new product from DecoArt (aren’t they the greatest?! 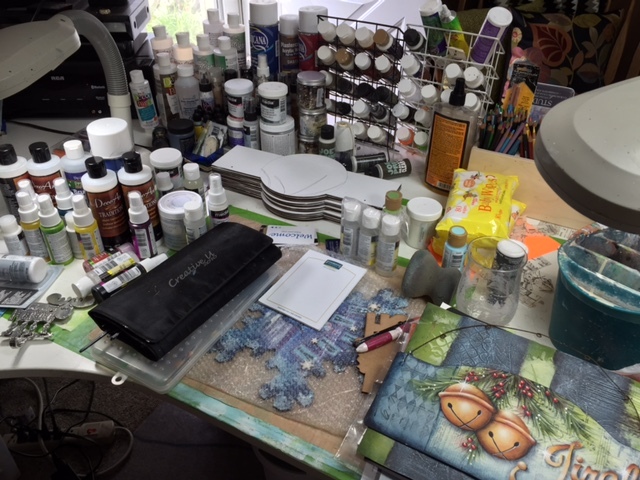 ), surfaces to prep for NET, class pieces from Portland & Rapid City, brushes, sponges, sample demo pieces, class pieces, patterns, etc…YIKES…I have EIGHT projects to design and paint BEFORE I leave in just 8 days! However, there is no way I can be productive in this chaos! I will work my magic and get everything in its place. It always looks worse than it is. Abracadabra…look at it now! It really didn’t take much time and now everything is in it’s place. I can relax, design, paint like a white tornado! 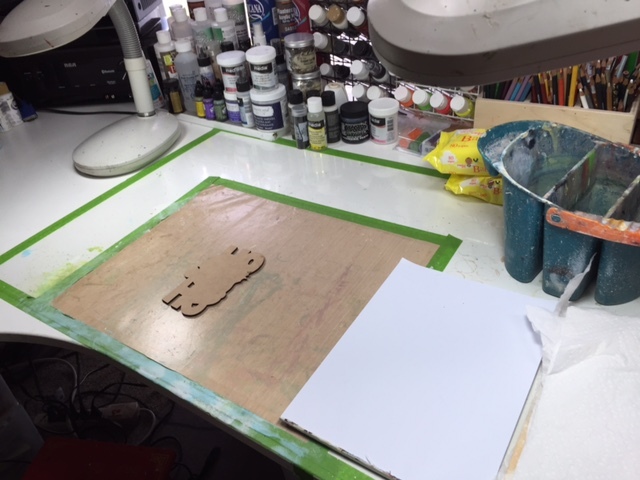 I know for a fact that a tidy work space is much more conducive to productive painting time. This blog is short, but to the point…Take time to clean after each project! There is nothing more deterring to painting than a messy area! So, if nothing else, tidy up and when the opportunity arises, the paint and brushes will welcome you with open arms! This entry was posted in Artists, Painting and tagged art, chris haughey, painting, studio on September 26, 2015 by Chris.